Amsterdam is jam-packed. Jam-packed of tourist but also of fun things to do. The city center is especially crowded during summer, but in winter months Amsterdam has the charm of the lights. Christmas lights, lights festivals, Sinterklaas, everything! It’s difficult to name only 20 things to do, but this list will keep you busy for sure. 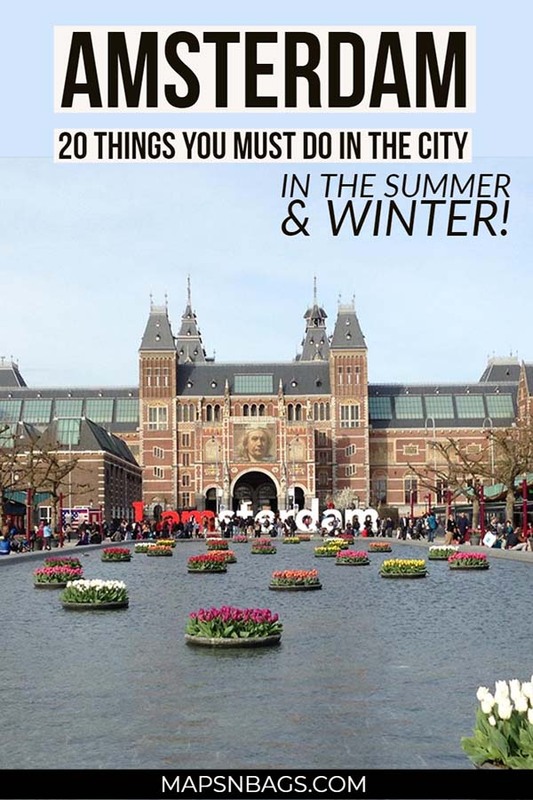 I’ve divided it into 10 things to do in Amsterdam in December, January, and February (winter months), and other 10 things to do all year long. Amsterdam city was my home when I first came to the Netherlands, and that’s why we have so many articles about it here on the blog. I was lucky to live in the heart of the country and even more fortunate to have a chance to discover in details the best things to do in this awe-inspiring city. There are things to do for all tastes, like having a beer in the Red-Light District, or admiring Van Gogh’s paintings in the Van Gogh Museum, or even eating your way around the city. Here you will find all sorts of attractions in every corner or even in every canal. 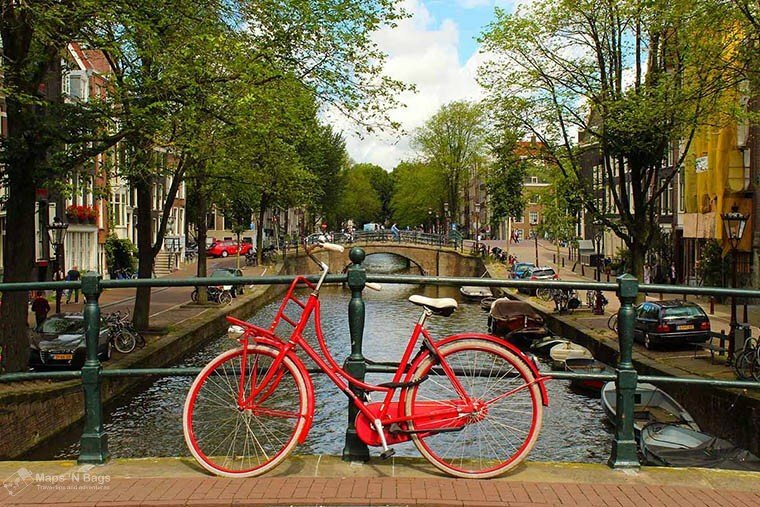 Want to know what to do in Amsterdam? Read on! Many people spend 3 days in Amsterdam and that’s just enough to see the main attractions. If you are following this guide I’ve just liked to (3 days in Amsterdam), but you still have some time left, read this article to find some other things to do in Amsterdam. In case you have a whole free day, you might consider going on a day trip. I’ve written a complete article with the best cities and towns in the Netherlands (and abroad) to go on a day trip. Check it out here! 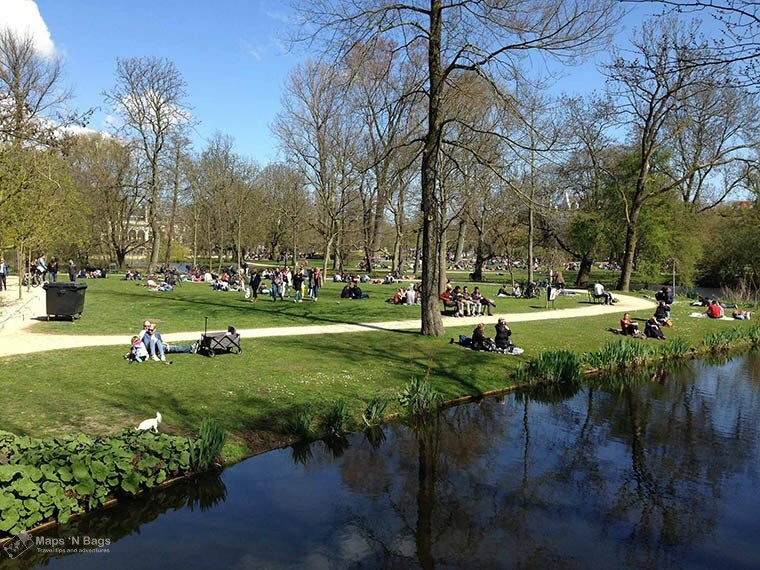 Spread over 47 hectares near the Leidseplein and the Museum Square, the Vondelpark is Amsterdam’s largest park. Tourists and locals enjoy spending time here – cycling, chilling in the sun, eating with friends, jogging, or just wandering. The park also has many facilities, such a playground, an open-air theatre with free shows from June through August, and a couple of bar/ restaurants. It gets crowded on warm days, so if you want to experience the local culture a little bit more, buy something to drink in the supermarket and chill on the grass. Cats, cats, and more cats. The Cats Cabinet is a museum dedicated to artworks showing cats. There are all sorts of arts, such as paintings, drawings, and sculptures. Some of them are made by Rembrandt and Picasso. If you’re lucky enough, you will see the owner’s cats walking around this quirky & cute museum. They’re cute! Fun fact: A few scenes of Ocean’s Twelve was filmed here. Whenever I travel to somewhere new, I always try their food even if it something, let’s say, unconventional in my culture. So, here’s your chance to do the same. There are lots of fisherman’s villages throughout the Dutch coast, so fish is guaranteed to be in their list of typical foods. The most common fish they eat is herring, and they eat it raw with onions and diced pickles. 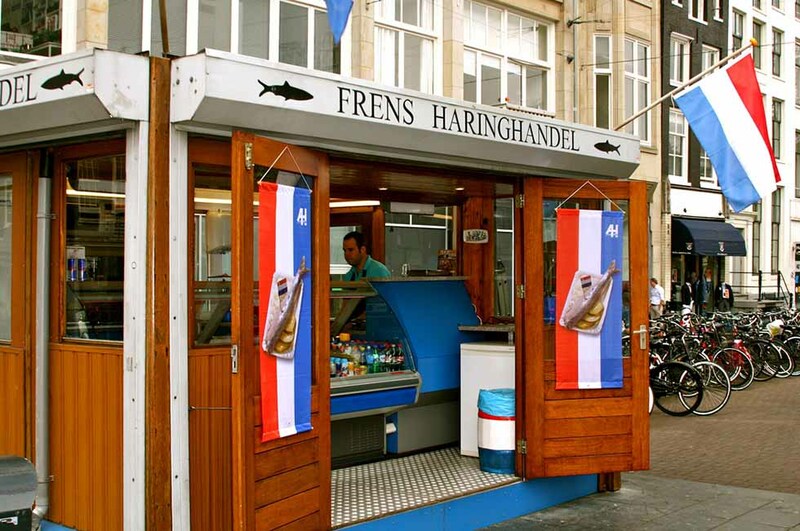 You can find herring in one of the many fish stalls in the streets of Amsterdam. Just so you know: It’s delicious! Amsterdam was once a port city, that’s why it has so many canals. The total length of these canals is 50km which is about 31 miles. Today, they are a pleasant attraction to millions of tourists and, of course, to locals as well. The most beautiful canals are in the 17th-century Canal Belt Area, which is a UNESCO World Heritage site. The Canal Belt Area includes the Prinsengracht, Keizersgracht, Herengracht, and Singel. A unique way to see Amsterdam is from the canal level. You can go on a boat cruise during the day; this is especially pleasant if it’s sunny, or in the evening, in the summer or winter. It doesn’t matter when they’re just gorgeous and a lovely experience. Rembrandt lived and painted in this house for many years, and now, it’s a museum that showcases not only his paintings but also the work of some artists who have been inspired by him. The interior was reconstructed and refurbished with furniture from the 17th-century when he lived here. Amsterdam is full of hidden treasuries and these houses are one of them. The Houses of the Seven Countries (Zevenlandenhuizen) was the result of a movement at the end of the 19th-century where the Dutch design was influenced by international architectures. If you’re looking for the best photo spots in Amsterdam, be sure to include these houses in your list. No. 20 Germany house has the romantic style prevalent at the end of the 18th-century. No. 22 France house has the Renaissance style typical of the Loire Valley’s castles. No. 24 Spain house has the Moorish architecture of the Southern part of Spain. No. 26 Italy house has a neoclassical architecture in pastel colors. No. 28 Russia house has similarities with the Kremlin: onion-shaped dome at the tower. No. 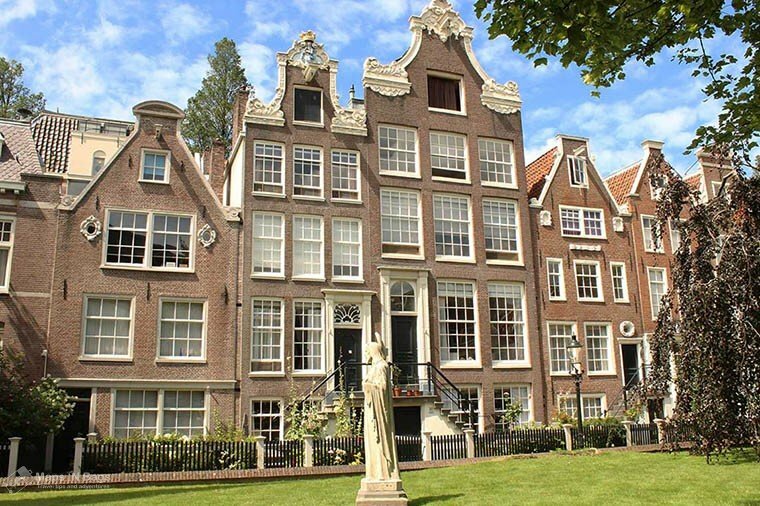 30 Netherlands house is a typical Dutch construction you can spot throughout the city, a Dutch Renaissance style. No. 30A England house has the same style as an English cottage with wooden details. 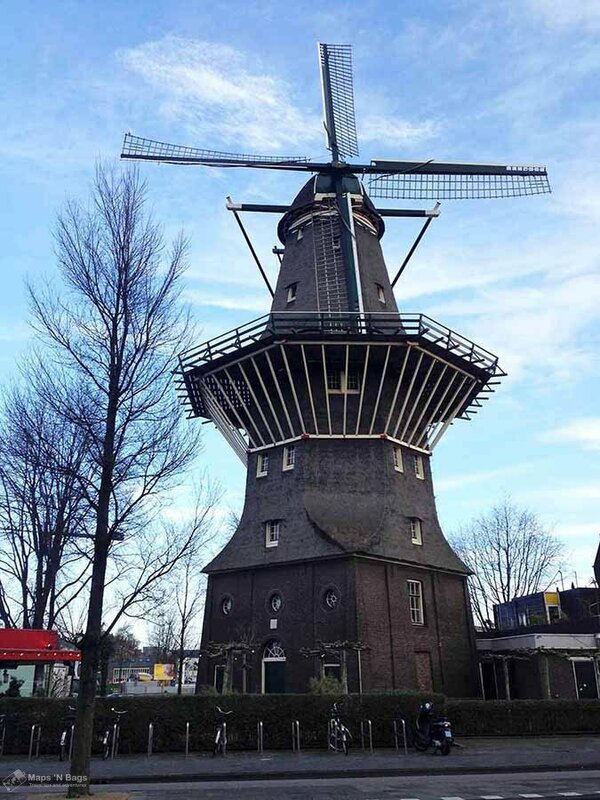 Besides cheese, bikes, and herring, mills are indeed a typical Dutch thing. And you can find a brewery inside one of them where you can have some beers or even take a guided tour. In sunny days, the tables outside the Brouwerij ‘t IJ get quickly crowded, so arrive early. The hipster spot of Amsterdam is right behind Central Station. Take the free ferry behind it towards NDSM and enjoy a beer in a shipping container cafe. This is a cool area where people chill on huge cushions and watch the sunset nearby the river. You can also stop by the IJ-Hallen, Europe’s largest flea market at NDSM-wharf. Check their agenda to know the exact dates it happens. 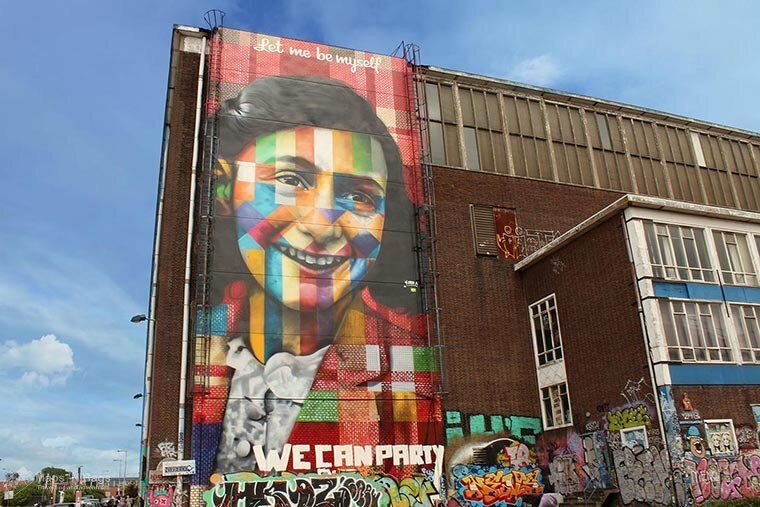 Pssst: The famous wall art of the Brazilian artist Kobra, Anne Frank “Let me be myself,” is located next to NDSM-wharf. Walk around to spot some interesting graffiti. Behind the Central Station are two free ferries. The one which brought you here, and the other towards the Eye Film Museum. This is a museum and cinema about the Dutch film culture. There is a bar inside where you can have some drinks while you observe the train station across the water. Beautiful! 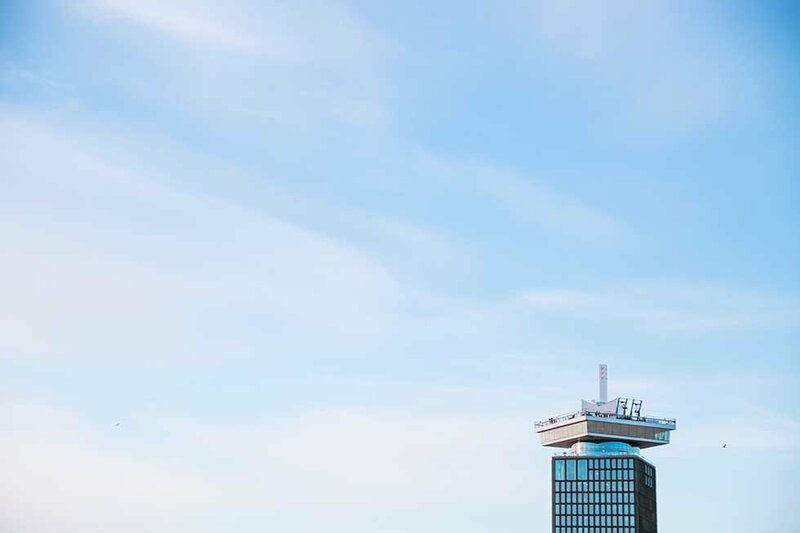 Near the Eye Film Museum, you will find the A’DAM Lookout Tower, a 20 floors building with one of the best observation decks of Amsterdam and the highest swing of Europe. I honestly think it’s slightly overpriced, so if you only have 3 days in the city, I wouldn’t reserve time to go in the swing. 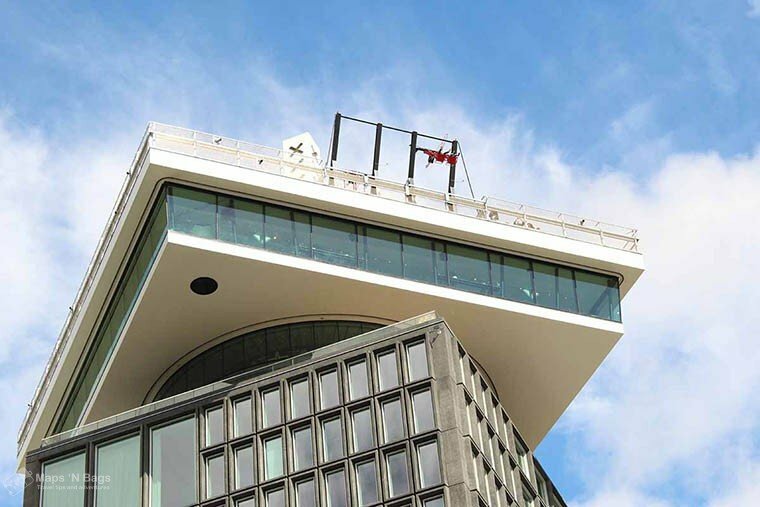 But if you have some time left and really want to see Amsterdam from 100 meters high, you can purchase this ticket which includes only the entrance and 2 drinks at the rooftop bar, not the swing. A’DAM Lookout Tower. At least part of it. 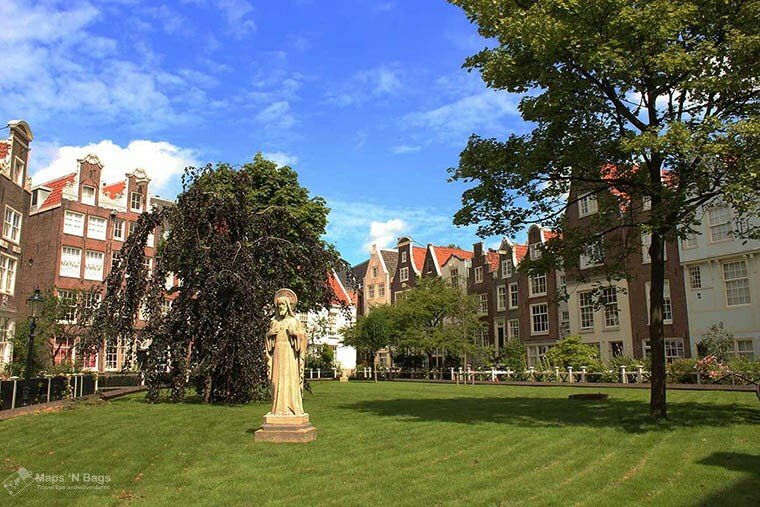 The Begijnhof is a real gem of Amsterdam which deserves a visit. This is the only inner yard in the city center and it dates to the 14th-century. This beguinage was built for very religious single women who didn’t take the vows. Following the tradition, only devoted women live there and they appreciate the silence and respect of tourists. So please, be quiet and respect their privacy. There are also two small churches in this yard. Now take a look at the houses below. They have the distinctive Amsterdamer architecture, which makes the city one of the top European destinations for many travelers. They usually have two/ three floors, are narrow and a little bit crooked. You might be wondering why they are like this. Well, Amsterdam was a vast swamp back in the 13th-century. So, to build houses in this area, they drilled wooden piles in the soil until they reached a solid surface. Thus the homes wouldn’t sink anymore. However, many houses sunk not entirely, but just a bit on one side. The reason for this is either rot wood or too much weight. The narrowness comes from the fact taxes were too high for those living by the waterfront, and the narrower their house was, the fewer taxes they would pay. Don’t think they are small the Dutch houses are very deep. Most of the residences throughout the city were built like that, only the houses that belonged to politicians or wealthy people would be enormous. Note that Amsterdam was a port city, so the main transport was the boat. Jordaan (pronounce it as eordaan) is a hip neighborhood because of its many vintage streets, indie cafes and top eateries, which are among the best restaurants in Amsterdam. Stroll around these interesting streets to get a little more of a local feeling as this neighborhood is not so crowded like the rest of the city. Anyway, eat Amsterdam’s best apple pie at Winkel 43, a few blocks away from Anne Frank House. Also, pay a visit to the Amsterdam Cheese Museum or to an exceptional and small museum: Houseboat Museum. 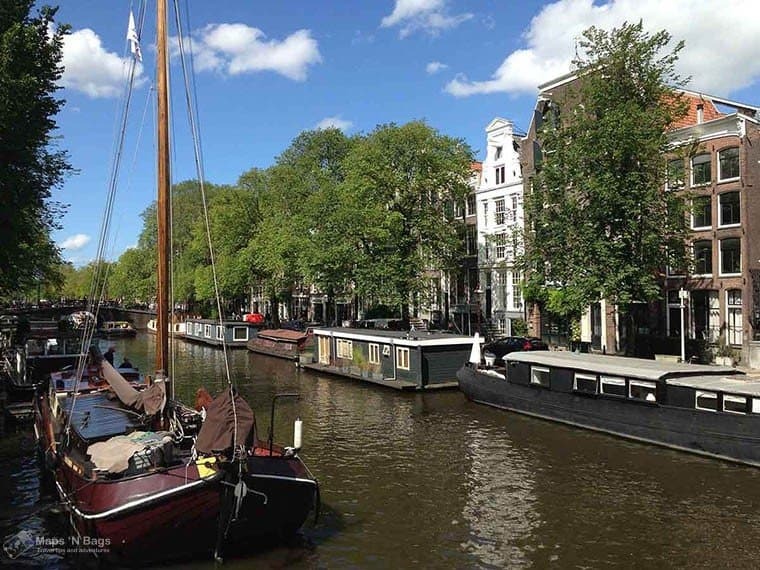 By now you have noticed a lot of people live in the canals of Amsterdam, so check out this place to see what it is like to live in a boat. Pssst: Visiting Amsterdam during winter is also a bit more expensive because most activities are indoors. 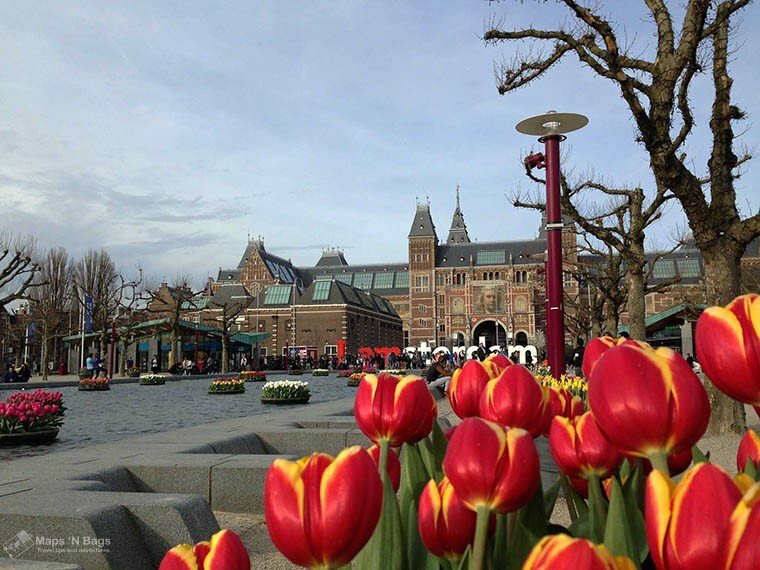 To save some money, purchase the Amsterdam City Card and get free access to a bunch of museums. Winter in Amsterdam can be chilly, windy, and wet. Brrr. That’s why most of the things to do in Amsterdam in December are indoor. The ones that are outdoors are supposed to warm you up, so don’t worry. Be sure to wear good winter clothing and you will be just fine. I wrote a detailed article with my complete packing list for Europe (there is a free printable for you). Ons’ Lieve Heer op Solder is a 17th-century house church and museum in the Red Light District. This well-preserved museum showcases all the rooms of a fully furnished house from the Dutch Golden Age. The big highlight of this place is the hidden church in the attic. The Our Lord in the Attic was a clandestine Catholic church during the Dutch Reformed Church period, and they couldn’t hold services back then. The museum is one of the oldest in the city. This is the cultural hotspot of Amsterdam and it has 4 excellent museums. The Rijksmuseum has an impressive permanent collection that includes Vermeer, a compact Asian collection, Rembrandt – his famous painting Night Watch is there -, and more! Their library is also magnificent, so if you visit the museum, you should stop by the library for sure. Since the museum is huge, reserve 4 hours to see everything. 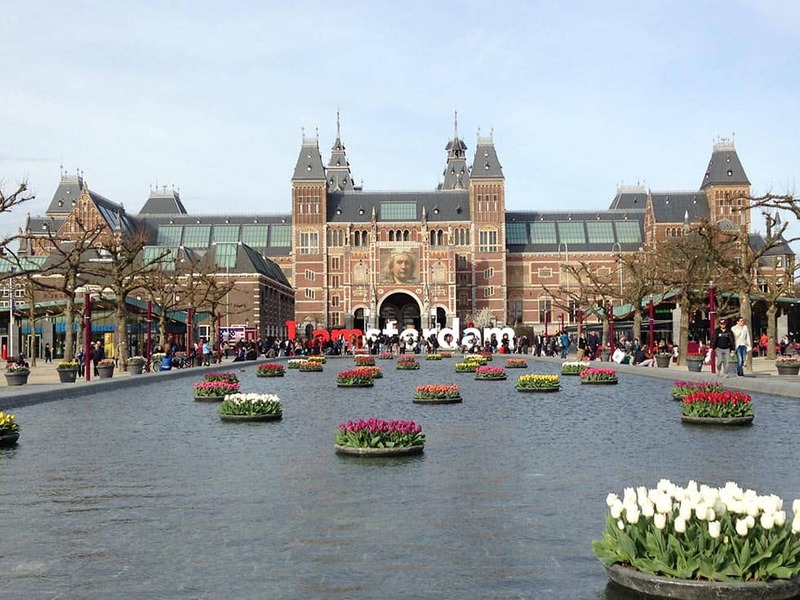 Pssst: The famous letters “I Amsterdam” are right in front of the Rijksmuseum. Arrive very early or very late in the evening to take a shot without crowds. From mid-November through January, you can ice skate in front of the Rijksmuseum and have the perfect backdrop. 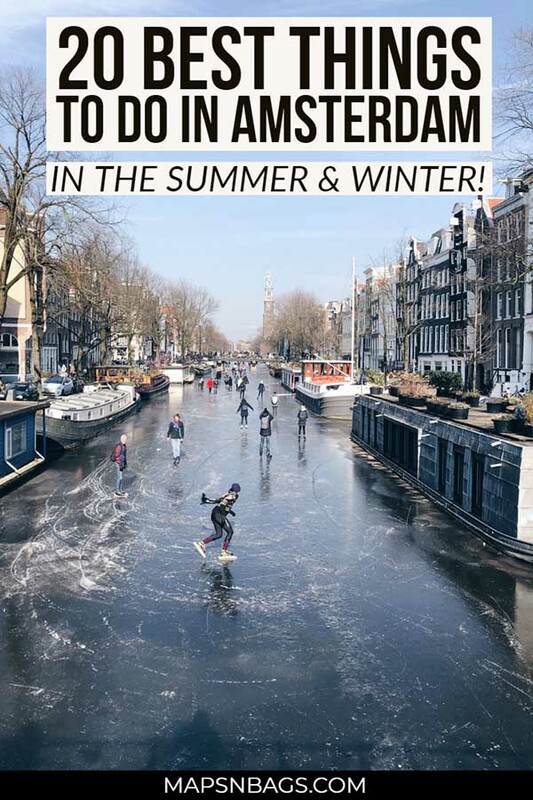 I’m by no means good at it, but for me, ice skating is one of the best things to do in Amsterdam in December, if you’re in town. It is funny, it warms you up a bit, and at the end, you can have some hot chocolate near the skating rink. Fun fact: There is a replica of the Magere Brug (Skinny Bridge) of the Amstel River in the middle of the rink. Fun fact 2: If the weather gets icy, you might be able to ice skate in the canals. Prices: Entrance + rental skates (2h) €13. Rental locker €2. 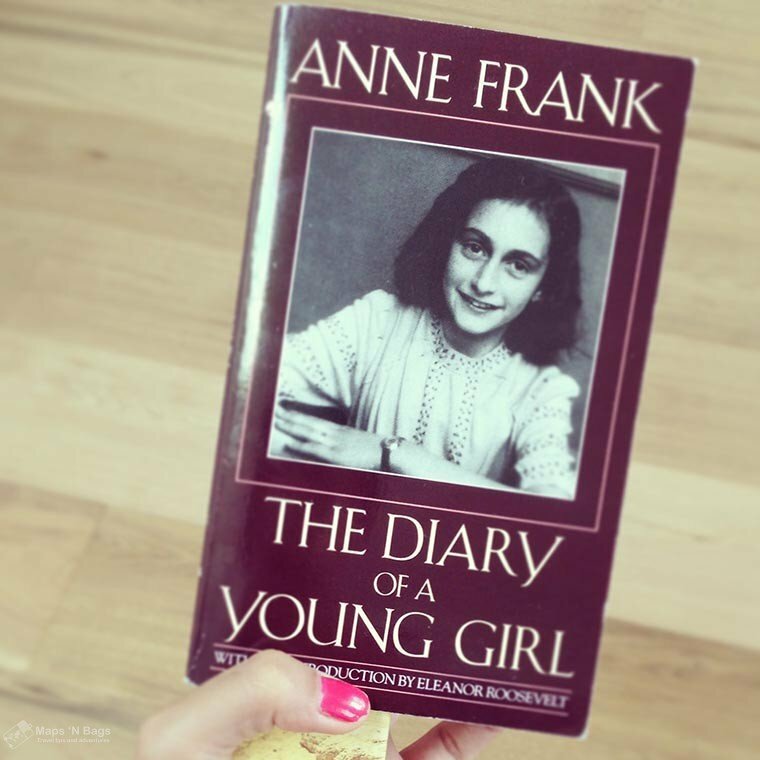 Learn in detail about the little Jewish girl’s hiding place and the story that inspired the world. Anne Frank House is a haunting place to go as you see the conditions they were forced to live in to hide from the Nazis. It’s really moving. One important thing that many people don’t know is that you’re not allowed to take pictures inside the museum. Please, respect this rule. Every year more than a million people from all over the world visit the museum, so buy your ticket online to avoid long lines. I went there twice and waited in the cold and rain for over an hour in both times. A big no! I love visiting Christmas Markets and have some tasty bites and one (or two) glasses of mulled wine (gluhwein)to warm up. Well, that’s what winter time is all about in Europe, so let’s make good use of it. So, among so many travel tips, visiting a Christmas Market is one of the best things to do in Amsterdam in December. It’s just so cozy! Pssst: Be sure to try freshly made oliebollen. But not any cinema. The most beautiful cinema in the Netherlands. 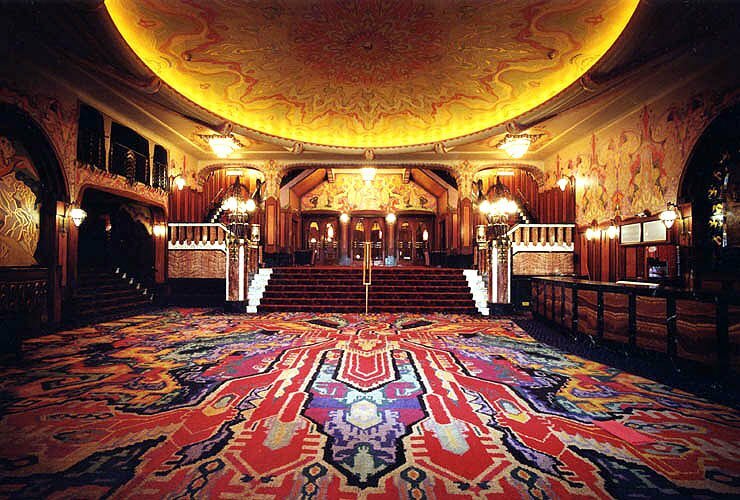 The Pathe Tuschinski was founded in 1921 by a Polish man and today you can watch movies at this vintage movie theater. If possible, choose the big room (Grote Zaal). This room is a spectacle by itself. Besides the chairs at the lower level, there are other two balcony floors. Truly gorgeous! Address: Reguliersbreestraat 26-34, 1017 CN Amsterdam. Tickets: €12.50 for the big room and €10.95 for the standard room. There is no way to run. Christmas comes lots of food, beverages, and gifts. I’m not complaining though. Anyway, among all the Dutch souvenirs you’re going to purchase, you can stop by Bierkoning for some craft beers, or by the quirky bookstore Mendo for some books of their curated assortment, or by the Kaasmaker for some local cheese. The Van Gogh Museum is a must in Amsterdam. From all museums in the city, this is my favorite one, and trust me when I say I’ve been to many! His highly-detailed paintings are worth your time. The queues are usually huge, so save your time and purchase this skip-the-line ticket to the Van Gogh Museum. You’re welcome. Even though Amsterdam isn’t a big city, thousands of tourists come in every day what makes waiting time to get into attractions kind of unbearable (that’s so true that for now, you can only buy the ticket to Anne Frank House online). 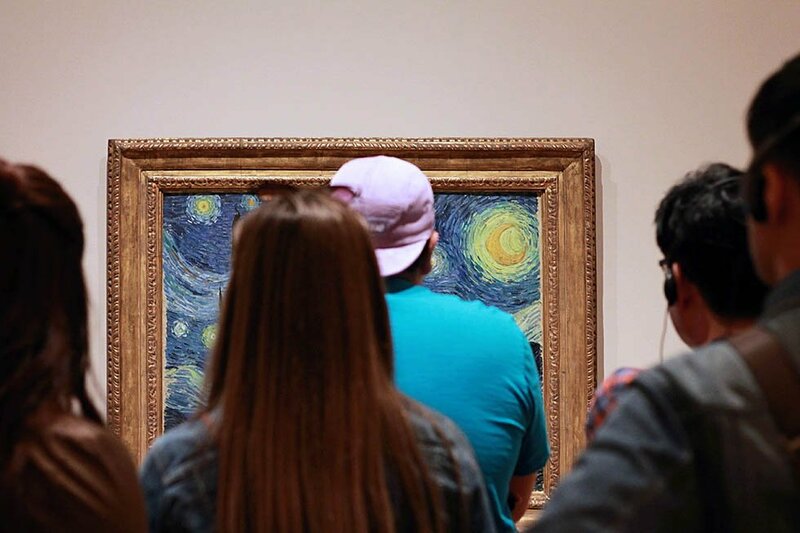 So be smart, save your precious time in the city and skip the huge lines in these museums, especially in the Van Gogh Museum, by buying your tickets in the links above. Anyway, if you’re looking for other museums to visit in the city, check out this guide on the best museums in Amsterdam. Winter time and Christmas arouse us to eat and drink a lot. This is just an excuse for me to eat more. Anyway, there is a delicious cafe near the Dam Square called De Drie Graefjes, and they have mouthwatering pies. Just so you know. Go upstairs and order a piece of lemon pie and hot chocolate. Thank me later! 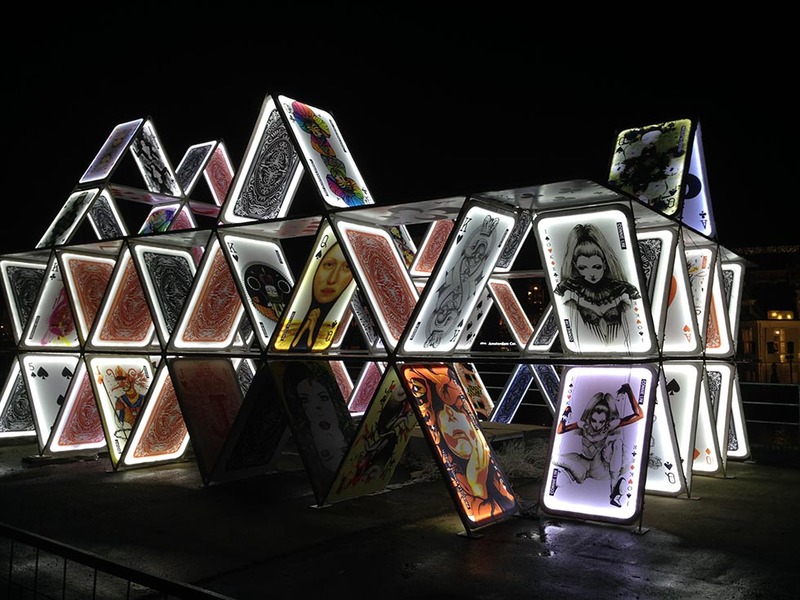 Amsterdam Light Festival happens every year from end November until end January, and it’s a great way to experience winter in Amsterdam. There are many displays spread throughout the city and you can follow the route by boat or on foot. Once they release this year’s theme and route, I’ll post it here so you can follow it on your own. Yes, is it! There are still lots of tourists in the city, but way less than in the summer. Be sure to weather a scarf, beanie, and a good coat because it gets reasonably chilly, wet, and windy. Most places to visit in Amsterdam in December are indoor, but still. So, if you’re planning to spend the winter in Amsterdam, know that there are many events throughout the city, so you won’t be bored. Do you have any questions re: things to do in Amsterdam in December? Drop your message in the comments and let’s talk! Did you like this article? Then pin it to your Pinterest board! This entry was posted in Netherlands and tagged Amsterdam, slider, Things to do. Thanks, Mayuri! I’m glad you like it!